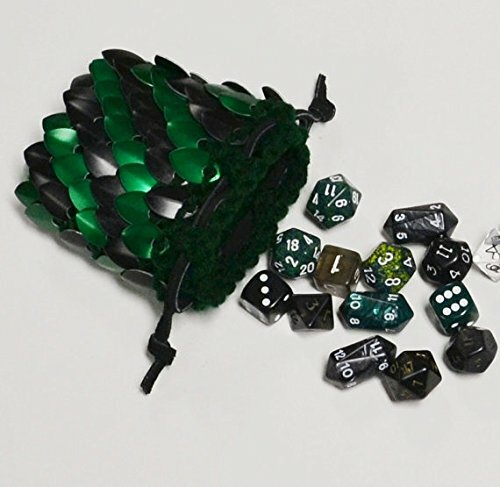 Dragonhide Scalemail Armor Dice Bag - Moar Stuff - You don't need it but you know you want it. 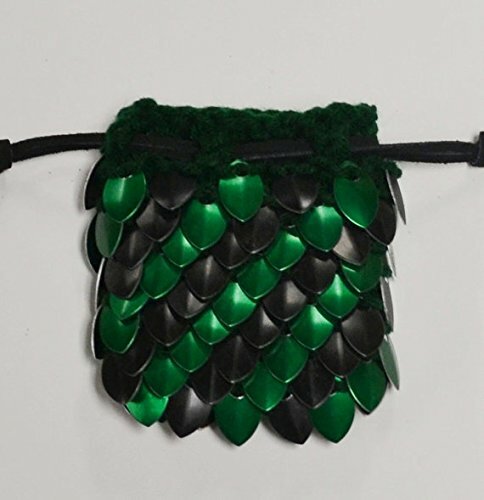 If you’re not careful, your party’s thief will pickpocket you to get this handmade Dragonhide Scalemail Armor Dice Bag. Make sure you boost your perception bonus to prevent it. 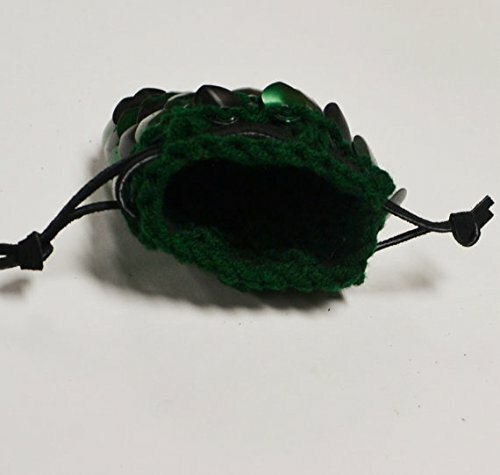 Made using a unique knitted scale mail technique, this awesome dice bag will certainly grab attention. They’re available in a variety of colors and sizes, so you’ll be sure to find once you like. The one in the pictures is one of the larger models and features brilliant red and silver scales flash against the matte black background in a pattern resembling the markings of a dragon. However, there are a lot of different colors available. In addition, if you contact the maker via her Etsy Page she may be willing to make you a custom bag (or other scale mail item) to order. These medium scale mail dice bags are 4.5 by 5 inches and hold around 50 dice. 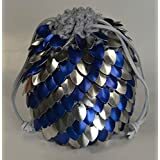 These large scale mail dice bags are 3.5 by 6 inches and hold around 100 dice. 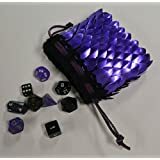 As you might expect given the name, the outside of the bag looks like scale mail, but the inside is soft and won’t scratch your dice. The design is stretchy should you make a good haul and need a little more room. The smaller bags will hold a single handful of dice. It measures 3.5″ wide x 3.5″ tall while the largest bags are 6.5″ x 3.5″ and hold up to 100 dice. Dimensions: 3.5 x 3.5 inches. 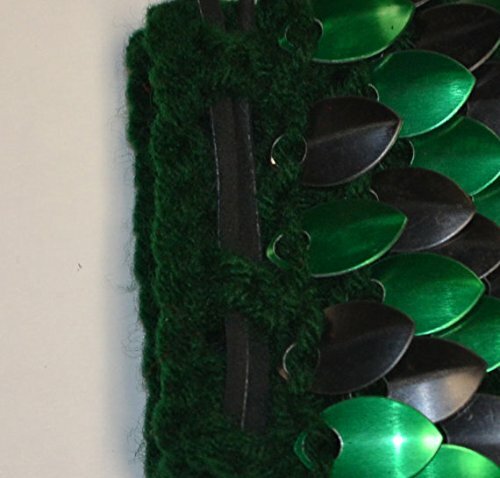 Material: Aluminum scales, yarn, leather. Color: Silver, black, and red. 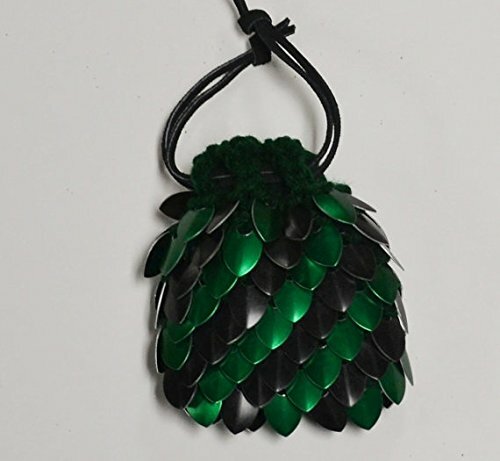 Handmade from the finest dragon scales you’ll ever find. +1 to AC and resistance dependent on the color you get.